Whenever I hear the word curry, I'm filled with a longing for spicy hot food with the fragrance of cumin, cloves and cinnamon. I see deep red colours from lots of Kashmiri chillis, tinged with a suggestion of yellow from turmeric. I think of the tandoor oven, and slightly scorched naan shining with ghee and garlic. When Indians talk of their food, they talk about their life. To understand this country, you need to understand curry. What makes a good curry? Sensual spicy aromas or thick, creamy sauces? Rich, dark dals or crispy fried street snacks? 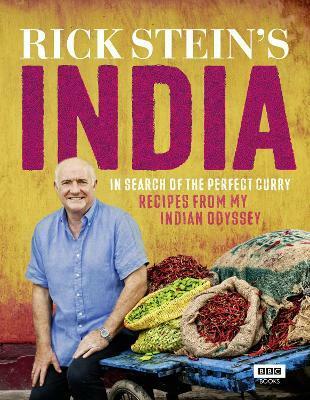 Rick journeys through India to find the answer, searching this colourful, chaotic nation in search of the truths behind our love affair with its food. Chefs, home cooks and street vendors hold the key to unlocking the secrets of these complex and diverse flavours - and Rick's travels take him to the heart of both their long-held traditions and most modern techniques. He uncovers recipes for fragrant kormas, delicate spiced fish and slow-cooked biryanis, all the while gathering ideas and inspiration for his own take on that elusive dish - the perfect curry. Rick Stein's passion for using good-quality local produce and his talent for creating delicious flavour combinations in his books and restaurants have won him a host of awards, accolades and fans. As well as presenting a number of television series, he has published many best-selling cookery books, including French Odyssey, Coast to Coast, Far Eastern Odyssey and Rick Stein's Spain. Rick is a firm supporter of sustainable farming and fishing techniques, which he strives to maintain in Padstow, Cornwall, where he runs four acclaimed restaurants and a seafood cookery school, as well as a delicatessen and patisserie. In 2003 Rick was awarded an OBE for services to West Country tourism. He divides his time between Padstow and Australia, where he opened a restaurant, Rick Stein at Bannister's, in 2009.